Thank you for inquiring about the liver transplant program at the Asian American Liver Centre. Liver transplantation is surgery to remove a diseased liver and replace it with a healthy liver (or part of one) from a donor. Patients with end stage liver disease who have failed standard medical and surgical therapy should be considered for liver transplantation. Signs and symptoms of end stage liver disease include jaundice (yellowing of eyes and skin), gray or clay-colored stools, ascites (excess fluid in the abdomen), edema, variceal bleeding (vomiting of blood), low platelet count, fatigue and worsening mental confusion. The donor’s liver is usually from a person who has died but has given permission for their organs to be donated (cadaver donor). It is also possible for a living person to donate part of their liver for transplant, know as living donor liver transplant as the liver has a remarkable ability to regenerate itself. 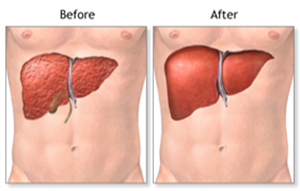 Both donor and recipient’s liver will grow back to normal size in a very short period of time. With the prevalence of liver disease in Asia, there is an increasing demand for liver transplantation for patients with the end-stage liver disease. There is a worldwide shortage of cadaver livers and even those which are donated, are offered preferentially to citizens of that country. Therefore, if liver transplant has been recommended by your doctor, you should consider living donor liver transplant as soon as possible. Since performing its first living donor liver transplantation (LDLT) in 2002, AALC has successfully performed 240 LDLTs to-date. Asian American Liver Centre has the direct link to one of the world’s most recognised transplantation programmes through the University of Pittsburgh Medical Center. AALC’s highly successful LDLT Programme has a dedicated Ward – Parkway Asian Transplant Unit with Intensive Care Unit (ICU) facilities, with state-of-the-art medical equipment such as liver dialysis machines and monitoring devices. This ensures that every patient receives the best treatment for his or her specific liver condition.